Hi and welcome to this years #12DaysOfParenting! 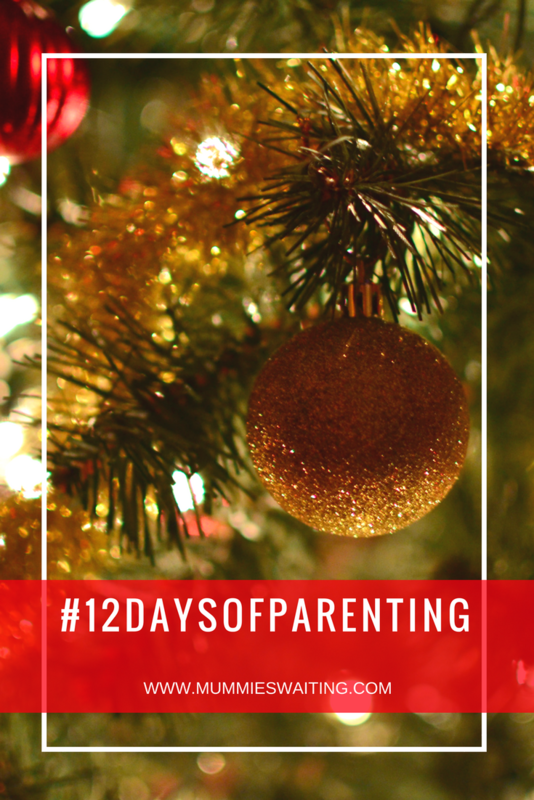 Here at 12 Days of Parenting, we are extremely excited (read ‘really insane’) to share with you all of the amazing craziness that is parenting at Christmas! The holidays can be so hard, trying to remember the turkey, secretly pick and wrap presents and get everything ready, but when you have children, it all seems to be 100x harder. So at #12DaysOfParenting, we will be sharing our tips, tricks and laughs to remind you that you are not alone this holiday, we are here to get you through the hard times and make you laugh so your Christmas is as perfect as you’ve planned! As always, we have a fantastic team of bloggers and brands behind #12DaysOfParenting and I’m going to share the prizes with you NOW! 14th – On the second day of parenting – The perfect family gift guide. Wonderbly will be offering a My Golden Ticket book for both the winner on the 14th and the Grand Prize Draw! 15th – On the third day of parenting – Activities to keep the family occupied. It’s A Sling Thing will be offering an Ergobaby Original Carrier for the 15th and a gift voucher for rental or retail orders for the Grand Prize Draw. They’re also offering a 5% discount code off both rental and retail orders with the code:12DAYSXMAS This works on retail orders from 1st December until 31st December, and on Rental orders from 1st December until 31st January. 16th – On the fourth day of parenting – Your Christmas Dinner De-stressed. Bags of Love are offering a personalise photo apron for both the 16th and the Grand Prize Draw! 17th – On the fifth day of parenting – Unique ways to spread the magic. CozyPhones are offering you to choose any pair of CozyPhones for the 17th and the Grand Prize Draw! 18th – On the sixth day of parenting – Family Traditions Sorted. Science4You are offering a Sweet Factory for the 18th and a Chemistry 1000 set as a joint Grand Prize for the Draw! 19th – On the seventh day of parenting – Mini gifts made simple.Bertie Blue Crafts are offering a crafted felt wreath for 29th and a crafted felt earrings and brooch set for the Grand Prize Draw! 20th – On the eighth day of parenting – Bloggers Choice! Learning Resources are offering a 8 pack set of Playfoam for both the 20th and the Grand Prize Draw! 21st – On the ninth day of parenting – My families list to Santa this year. Science4You are offering a Science of Slime for the 21st and a Chemistry 1000 set as a joint prize for the Grand Prize Draw! 22nd – On the tenth day of Christmas – Things to do outside this Christmas season. Geocaching are offering a 1 year membership for both the 22nd and the Grand Prize Draw! 23rd – On the eleventh day of parenting – 12 ways parents can relax this season. Plyt are offering a Plyt board game for the 23rd and a NumBugz board game for the Grand Prize Draw! 24th – On the twelfth day of parenting – Parenting Highlights of the year and 2018 New Years Wishes. Gitte Winter Graugaard is offering a copy of The Children’s Meditations In my Heart for the 24th and the Grand Prize Draw! So head over to the #12DaysOfParenting Facebook page to get updates on what is going on. Each prize will be stated on the Raffelcoptor. There will only be 1 of each prize unless otherwise stated. All prizes are non-transferable or redeemable for cash. The winner will be contacted by e-mail, if they do not reply within 10 working days another winner may be chosen. Giveaways are open to residents of the UK only. All information detailing how to enter the giveaways form part of these terms and conditions. Supplying an email address within the Raffelcoptor widget means that the entrant is willing to be added to the mailing lists of Mummies Waiting and the Sponsors. Upon receipt of any correspondence from these companies, the entrant will be free to unsubscribe at any time. Winners will be chosen at random through Raffelcoptor and the winners will be notified as soon as possible after the draw. Events may occur that render the competition itself or the awarding of the prizes impossible due to reasons beyond the control of the Promoter, and accordingly, the Promoter may at its absolute discretion vary or amend the promotion and the entrant agrees that no liability shall attach to the Promoter as a result thereof. Each winning entry will be validated, and if the instructions for entry have not been followed for that Raffelcoptor entry, a new winner will be chosen. Each Raffelcoptor entry is a single entry into the giveaway and stands alone as such. Any incorrect entries from the winner only make these entry methods invalid, not all the winners’ entries. The winning entry method from them will still be valid as long as it complies with our other terms and conditions. The giveaway may be added to a number of sites for the purposes of promotion.